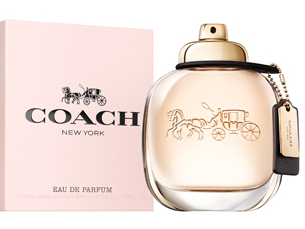 Coach Eau de Parfum is the ultimate accessory, embodying the values and heritage of the iconic American luxury brand. Rooted in the cool, urban atmosphere of New York City, it is a spirited, sensual scent that symbolizes a resolutely contemporary, independent woman, a modern classic. Coach mixes iconic American style in an assortment encompassing not just leather goods, but a full ready-to-wear collection as well as footwear and accessories for both men and women. Yet one element was missing from Coach's portfolio: an iconic fragrance. As such, Stuart Vevers has been involved in every step of the creative process in developing Coach Eau de Parfum, ensuring it is the true representation of everything the brand stands for. In 2016, Coach will be celebrating its 75th anniversary with the launch of the new Coach fragrance. Coach Eau de Parfum takes its inspiration from the brand's iconic codes in an olfactory interpretation of modern luxury rooted in the cool, urban ambiance of New York. Like the brand's leather creations, it is the ultimate timeless accessory. Created by perfumers Anne Flipo and Juliette Karagueuzoglou, it is a floriental fruity scent inspired by the spontaneous energy and chic downtown style of New York City. A fragrance full of contrasts, Coach Eau de Parfum opens with bright, sparkling raspberry which gives way to creamy Turkish roses, before drying down to a sensual suede musk base note. It is the essence of the Coach Woman. The feminine, sensual bottle - a heavy glass oval is emblematic of the Coach brand. Its spray cap is shaped like a gold turnlock imitating the iconic clasp of Coach's most famous bags. The brand's distinctive hangtag in ebony leather and gilt metal is a luxurious finishing touch, while the horse and carriage logo, an enduring symbol of Coach craftsmanship, is subtly engraved into the glass. THE PACKAGING A tribute to the luxury heritage of Coach leatherware, the fragrance's outer packaging reproduces the comfortable, tactile nature of a Coach pebble leather bag in soft pink with a contrasting ebony logo. It evokes both the femininity and boldness of the Eau de Parfum while showcasing the brand's iconic horse and carriage logo. Chloë Grace Moretz became the face of Coach fashion with the brand's 2015 Spring Ready-To-Wear Collection, Stuart Vevers' first for the brand. In 2016, she appears in the campaign for Coach Eau de Parfum, becoming a true brand ambassador. Moretz embodies Coach's values - an all-American girl who is youthful, modern and authentic with her natural beauty, fresh face and free spirit. Available 4th September, 2016 from Myer, David Jones, and selected stores.